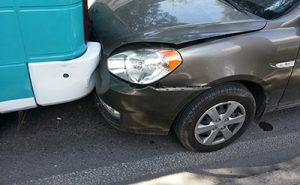 Minor fender benders occur all the time on Colorado Springs roads. These slow speed car accidents may seem like no big deal at the time, but they can cause serious injuries. In fact, many of these injuries go unnoticed and undiagnosed, often complicating recovery. When soft tissue injuries aren’t treated quickly, they can lead to long-term pain and chronic disability. Unfortunately, insurance companies are reluctant to pay slow speed accident victims what they deserve and they will often resort to deceptive tactics to reduce their payouts. Even though you may look uninjured, this may be deceptive. It has been proven that impacts at just 2.5mph are sometimes enough to cause injury to the neck and spine – also known as the whiplash effect. Accidents that occur at 10 mph or 15 mph can impart energy to the neck that is as much as 4-6x the threshold for injury. Therefore, even accidents that result in little to no vehicle damage, may actually cause injury. In fact, ligament damage can occur at speeds just above 7.5 mph where the headrest is not properly set or if the head is turned sideways at the time of impact. This can result in pain that can last for months. Insurance companies are notoriously skeptical of injuries claimed in low speed accidents. That is why it is so important to preserve evidence and collect all treatment records. Be sure to be seen by a qualified medical professional as soon as you begin to experience symptoms. Once you have received a diagnosis, do not miss any treatment programs, therapy sessions, or follow-up appointments. In addition, fill all medications and follow your doctor’s orders precisely. Failure to do so will give the insurance company the evidence they need to reduce your claim. If you or someone you love has been injured in a car accident, you will need a law firm on your side that is ready and willing to fight for you. At the Rector Law Firm, our Colorado Springs car accident attorneys have the experience and the resources to build a case that is designed to obtain maximum compensation for our clients. Call us today at 719-578-1106 for a free initial consultation and review of your case.